The process to grow diamonds in a laboratory is very similar to the geological growth process. In other words, diamonds are grown above the Earth by recreating the conditions below the Earth where carbon crystallizes into diamond. Thus, the same types of inclusions and imperfections present in mined diamonds can also occur in lab diamonds. While synthetic diamond is a commonly used term for a laboratory-grown diamond, Ada Diamonds contends that synthetic diamond is not a scientifically accurate term for lab created diamonds, as there is no synthesis required to grow a diamond in a laboratory. Diamonds are merely a form of carbon, not a complex molecule synthesized from multiple precursor elements. There is no such thing as a fake diamond. There are just diamond simulants and diamonds. 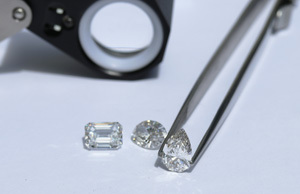 Ada Diamonds refuses to sell diamond simulants such as cubic zirconia or moissanite, as diamond simulants are cheap, inferior facsimiles of diamonds. A Laboratory-Grown Diamond is Forever. It has the same physical and optical properties of a mined diamond. It will not change color. It will not change appearance. It will look exactly the same in a million years as it does the day you receive it from Ada Diamonds.